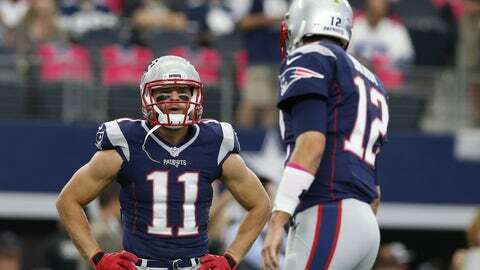 New England Patriots receiver Julian Edelman's dropped pass resulted in the first Tom Brady thrown interception of the 2015 season. It took a drop from one of Tom Brady’s most dependable wide receivers for the New England Patriots quarterback to throw his first interception of the season. Brady targeted Edelman early in the second quarter deep in the Patriots’ own territory in their 34-27 Week 6 win over the Indianapolis Colts. Edelman suffered his third drop of the game, and it popped directly into Colts safety Mike Adams’ hands. Adams brought the turnover back for a touchdown, and Edelman took full blame for the pick six. Edelman still had a strong game, despite the drops, catching six passes for 50 yards and a touchdown and picking up a key first down on a 2-yard jet sweep. Brady now has a 118.4 passer rating on the season, completing 70.6 percent of his passes for 1,699 yards with 14 touchdowns and one interception. He went 23 of 37 for 312 yards with three touchdowns and the pick against the Colts.